For those that happen to miss out on the live action first time around, each day’s show will also be re-broadcasted at 2am EST the following morning! The channel will be broadcasting exclusive live performances, artist interviews, backstage footage and all of the best moments from this year’s double-weekend. This inaugural live event will be created and directed by Charly Friedrichs - Director of the Ultra Music Festival film Can U Feel It - and the rest of his Final Kid team. 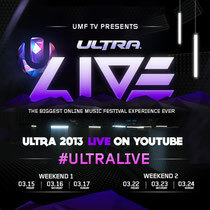 To subscribe to UMF TV, click HERE.